Estee Carrizosa will debut as Laguna Beach High School’s new dance instructor when “Shift” happens, the school’s winter dance concert in the Artists’ Theatre, Friday and Saturday, Dec. 12 and 13, at 7 p.m.
Carrizosa is 5-foot-3, petite, with long brown hair and a luminous smile; she blends right in with students pushing through the halls of the high school. No one would suspect Carrizosa is old enough to have a bachelor’s degree in dance science from Cal State Long Beach, that she’s working on a graduate degree there and is in her first semester as the new artistic director of the school’s dance department. The word among students, their parents and Carrizosa’s peers is that hiring her was a good move. Carrizosa replaces Lisa Jay, who taught dance at the high school for six years. By chance, Jay ended up hired to fill Carrizosa’s former position as dance instructor at Burbank High School. Underlying her practiced poise, preciseness of language and adept organizational skills, Carrizosa was just as squeezed this week running dress rehearsals as any dancer there in the throes of finishing up assignments and studying for tests before Christmas break. Pre-show tension, focus on sequence timing along with sweat, body odor and exerted breathing filled the air. The show is called “Shift,” says Carrizosa, because it represents her way of seamlessly maneuvering the dance department into a new approach, putting her students’ emotional well-being before perfection of steps. “Self-esteem means more to me,” she said. “Yes, of course, I’m in the business of teaching them dance, okay, and it’s wonderful if they learn a dance move. But if they walk out of here with their chin a little higher and their chest pulled back a little bit more and they feel more confident about who they are as a person, I’m more interested in that than a dance move. “I believe dance has the power to increase their sense of self-esteem. That‘s the backbone of everything I do.” Carrizosa joked that she might become known as Esteem Carrizosa. Carrizosa started taking dance lessons at 2 in her hometown of Visalia and competed for 10 years at a private studio. Dance became emotionally essential for her, she said, after a break-up with a boyfriend when she was 20. Dance can become a healing emotional outlet for grief or personal traumas, she said. “They don’t have to explain anything,” she said. “Whatever emotions they are channeling, they can express it.” That, she said, is the foundation of creative expression and self-confidence. Some students are getting their first chance at choreographing a dance routine in “Shift.” Long-time contributors, such as Kathy Kahn, who ran Laguna Beach Ballet studio for 40 years, choreograph other routines. “The students are excited and so are the parents,” said Christine Fugate, whose daughter, Caterina Jacobs, is a freshman and just starting in the dance program. Kahn has been choreographing at the high school for five years and created an arrangement for “Paquita,” a traditional ballet, in this weekend’s program. Carrizosa’s goal, with the help of assistant dance instructor Samantha Hampton, is to get more students dancing. 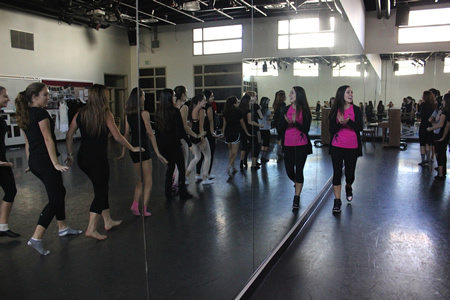 While dance director at Burbank High School, Carrizosa expanded the program to 465 dancers from 100. So many students joined the school ran out of space, she said. Carrizosa replaces Lisa Jay, who taught dance at the high school for six years. By chance, Jay ended up hired to fill Carrizosa’s former position as dance instructor at Burbank High School. Along with already-existing classes in modern, jazz and ballet, Carrizosa plans to add hip-hop, social dance such as ballroom and cha-cha and cultural dance such as African and other ethnic dances. She and Hampton, who started full-time this semester and looks just as much like a teenager, are also asking students to choreograph more pieces that will include all levels of dancers, not just advanced and elite students, and to introduce their work at the spring dance concert. “I’ve got a real good hold on the pulse of the student body and their appraisal is she’s doing a great job.” said Mark Dressler, the school’s 25-year drama teacher. “In reality, 99.9 percent of the students in performing arts aren’t going to make a career out of it,” he said. “What they learn here, he said is how to collaborate to create something together, a life-skill needed for all types of relationships.